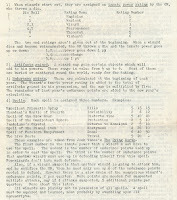 From the summer of 1971, this excerpt shows the initial Wizard system developed for a game called Midgard, as disseminated through the seventh issue of Hartley Patterson's original Midgard fanzine. This issue dates a little after the release of first edition Chainmail, and a little before the additions to the Wizard rules Gygax would write up at the end of the year for the International Wargamer which divided Chainmail Wizards into level-like ranks. It is noteworthy for several historical reasons, not least for ostensibly being the earliest spell-point system. Years ago when I put together Playing at the World we had only fragmentary direct evidence from the various campaigns in the Midgard family. Today, we can do a bit better. 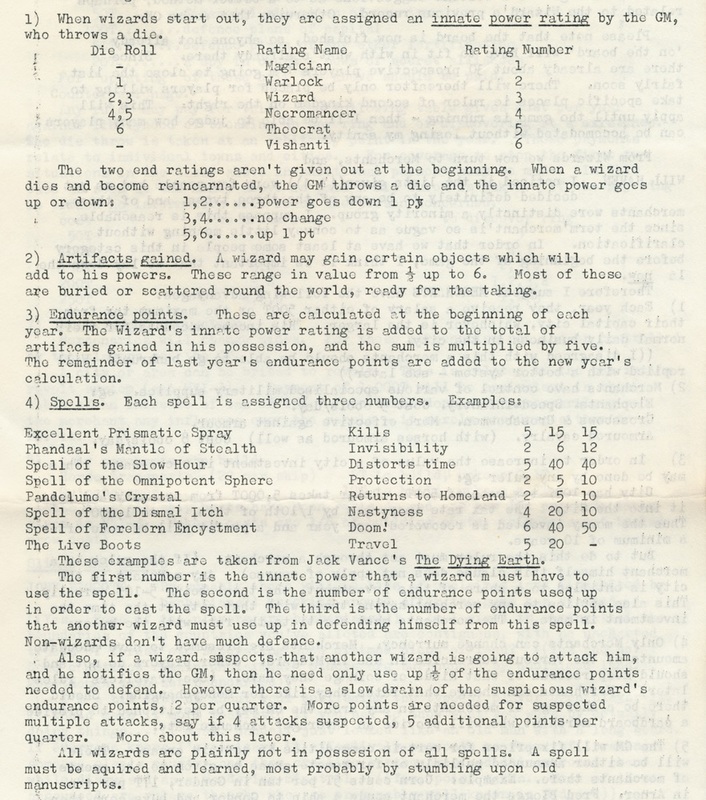 As the first issue of Patterson's Midgard fanzine came out in January 1971, a couple months before Chainmail, the game is of some interest to historians of fantasy gaming. There is a great deal to unpack just from this one page from seven months later in August. First, the original Midgard magic system was based on spell points, and given how few fantasy rules had appeared to date, there is little reason to hope we will find an earlier game that used them. Wizards in Midgard have a resource called "endurance points" which serves as a reserve of magical energy: casting a spell expends a number of endurance points, as does defending against spells cast by enemy wizards. Wizards automatically recharge a certain amount each year (years go quickly in Midgard I), a total which may be augmented by finding magical items. Chainmail, published just a few months earlier, granted Wizards the ability to throw arcane missiles, either a "fire ball" or "lightening bolt," and to cast six utility spells, ranging from Phantasmal Forces through to Conjuration of an Elemental -- but it gave no indication of how often spells could be cast. * That would be rectified in Gygax's "Chainmail Additions," which limits the number of spells Wizards can cast each game by sorting Wizards into "classes". Which brings us to the second interesting element of the Midgard system: Wizards had a rating name and number, on a scale from 1 to 6 starting with the lowest "Magician" and working up through "Warlock" before hitting the middle rank of "Wizard." 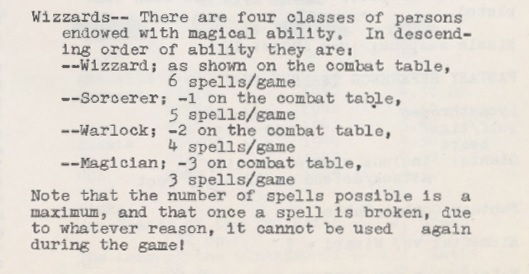 This is striking in light of the International Wargamer wizard classes for Chainmail that would appear a few months later: they too have the lowest ranks as "Magician" then "Warlock" below "Wizard", though the "Chainmail Additions" establish only four such classes instead of six. Note that neither the Chainmail nor the Midgard system here has a concept of advancing in class or rating by accumulating experience in the game world. Midgard Wizards could gain additional endurance points through adventuring by finding artifacts, but that did not boost their rating. This system did have a charming and clearly Tolkien-inspired concept that when Wizards die, they are reincarnated and that their rating randomly goes up or down then -- Gandalf the Grey was obviously among the fortunate ones who returned in a more powerful incarnation. Patterson would gloss that he was "a bit dubious about arbitrarily changing a Wizard's rating," and solicited "a better method, perhaps related to the Wizard's previous record." While we shouldn't read too much into such a high level remark, it does sound a bit closer to an experience system as we would see in Blackmoor. 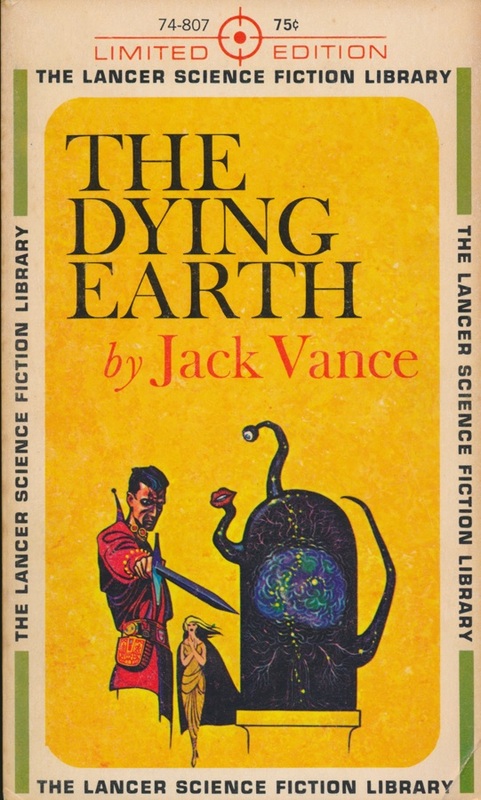 Third, the Midgard spells are derived from Jack Vance -- though this does not mean that magic in Midgard was "Vancian" in the memorization sense familiar from D&D. What it does mean is that Vance's Dying Earth spells with names like the "Excellent Prismatic Spray" and "Phandaal's Mantle of Stealth" became part of the Midgard system way back in the summer of 1971. "Prismatic Spray" would not enter the D&D lexicon until Aronson's "Illusionist Additions" in The Dragon #1, five years later. Fourth, in Midgard, a Wizard requires a certain rating in order to cast a spell. This concept was also missing from the first edition of Chainmail, but is just barely present in second edition Chainmail the following year, as the spell "Moving Terrain" is "only possible to a Wizard," not to the lower ranks. Since Chainmail did not provide campaign rules, it remained silent on another point that Midgard raised: the requirement that "a spell must be acquired and learned, most probably by stumbling on old manuscripts." 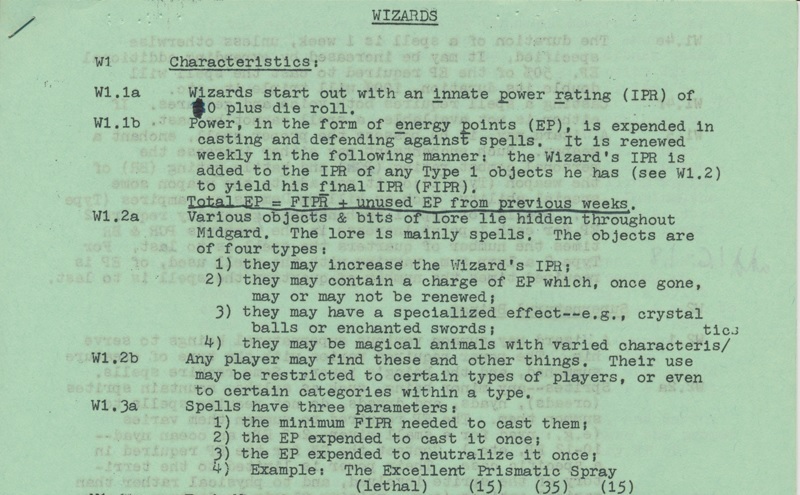 The question of how Wizards learned spells only began to be addressed in D&D after the original game was released. In Midgard II, an innate power rating (IPR) had replaced the "rating" of Midgard I. Now, artifacts and lore found in the world do add to a Wizard's IPR; indeed, in Midgard II, even finding certain herbs would grant +1 to IPR. "Endurance points" are now called "energy points," which refresh on the faster scale of a week in Midgard II. By this point, there were 58 different Wizard spells to expend your energy points on, and Vance's "Excellent Prismatic Spray" was still one. Notably, Wizards in Midgard II could now summon elementals, in a system reminiscent of Chainmail -- but they could also summon various kinds of sprites, and even forge pacts with demons. The existence of such a developed magic system in 1972 confronts with us with the stark reality that D&D was not alone on its trajectory, and that we have to understand its development in a broader context of parallel efforts at the time. And the energy points Wizards spent in Midgard prefigured every mana bar in the fantasy computer games that would follow. Yep, more great stuff. Thanks for continuing your work. Six spell levels. Invisibility as a second-level spell.